Bees feed pollen and nectar to their young and are beneficial insects that pollinate fruits, vegetables, and many other plants. When stung by a honey bee scrape the bee’s stinger out of the wound immediately, but do pull it out because you will force poison into the wound. If the stinger is not removed, the poison gland attached to the stinger will continue to pump poison into the wound for several minutes. In spring and early summer, honey bee colonies divide by swarming. Swarms become a pest problem once they land in an inconvenient spot or enter a building. If a bee swarm is causing a problem at your residential or commercial property in a tree, bush, in a wall, or in buildings contact Agent Pest Control to remove or kill the bees at your Las Vegas, North Las Vegas, Henderson, or Boulder City, NV location. Insecticide dust is effective for killing bee colonies in buildings and a mixture of soap and water may be used to spray a swarm attached to a tree or wall. Do not attempt to remove bees without the protection of a bee suit. Once the queen bee is gone the worker bees that are still alive away from the hive at the time of service will latch onto another colony after they come back and realize their queen is missing. The African honey bee defends its hive far more than does the European honey bee. Hundreds if not thousands of killer bees, as they’re sometimes called, will attack if they feel they or their hive is threatened. From personal experience, we have had killer bees follow us down from the top of a second story roof and into our truck. If we did not have a bee suit on at the time we may have been severely injured. European honey bees would not travel that far to defend their hive. 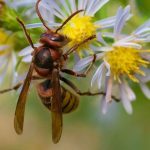 In Las Vegas, North Las Vegas, Henderson, and Boulder City, NV the most common wasp is the paper wasp which builds its nest by attaching it under the eaves of a house or another structure and will also build nests in vegetation. Paper wasps are around an inch long and gather mud as well as fibers from plant materials. They then mix these with their own saliva and use it to make their nests which have a grayish, paper look to it, hence the name paper wasp. Paper wasps are social insects and will only attack if they feel they or their nest is threatened. Wasps do not leave a stinger and are capable of stinging many times. We will kill paper wasps on contact and we will remove the wasp nest if we can reach it. PEST CONTROLThere are different types of controls to get rid of bees and hornets. Taking the garbage out regularly should help get rid of bees and hornets.